On the 18th of April 1942, Jimmy Doolittle and a throng of 15 gallant soldiers flew off the deck of the USS Hornet for a historic mission to bomb Tokyo. It was one of the boldest missions of World War II. The highly confidential mission had been planned several months before the attack. Jimmy Doolittle had been assigned to lead, organize, and plan the bombing. The dual engine Mitchell B-25 Doolittle Raider was personally selected by Doolittle for the event-turning mission. This further supported the possibility that the aircraft can be established from a carrier deck that has a runway of less than 500 feet. This model display of the original aircraft truly reflects the aircraft’s distinct and unique character. It’s an important reminder of the destructive nature of war while at the same time it showcases man’s unending quest to gain ultimate victory against his adversaries for the love of his homeland. 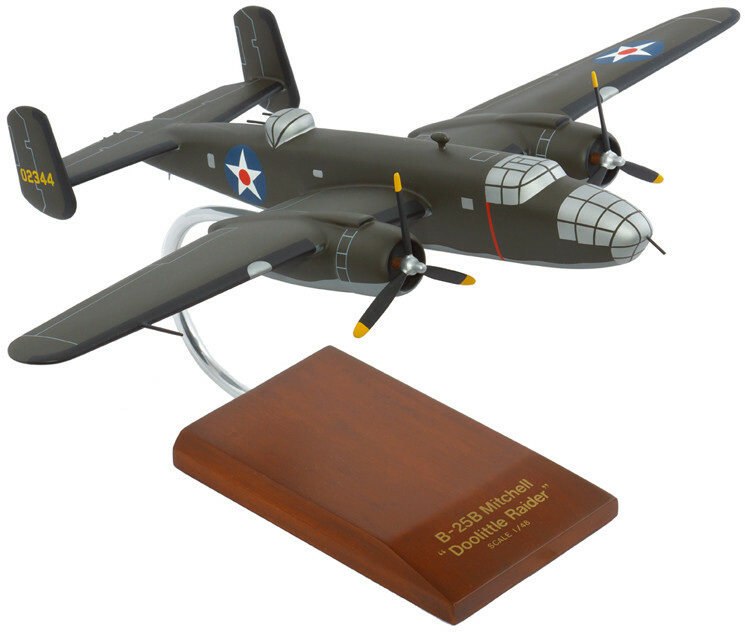 Bring home this model today and be reminded of how B-25 became a huge part of history.